Annie M. Williams departed this earthly realm, peacefully on Thursday, August 23, 2018 at Brookdale Assisted Living in Potomac, MD. Annie was born in Edgefield, SC on July 24, 1925 to the late James and Cora McManus. 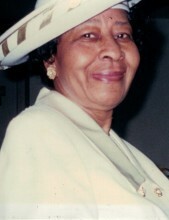 She moved with her family to Washington, DC in the 1930’s where she lived many exciting and fruitful years. Annie was the oldest of her siblings (Lucille, Dorothy, James and John) and was known as the matriarch of the family – the glue that held everyone together – the one that everyone turned to. In 1948, she married the love of her life, the late Chancellor Williams, Jr. and from this union, were two children – Shari and Angela. A graduate of the District of Columbia Cardozo High School, she began her career with the Federal Government and retired after 40 years as an Accounting Supervisor with the Navy Regional Finance Center. Annie loved God and proudly served as an Usher at Mt. Horeb Baptist Church for many years. She also served in several capacities including Past Grand Daughter Ruler with the Improved Benevolent and Protective Order of Elks of the World, Inc. Annie was a strong, independent, loving woman who treasured her family and friends. Annie leaves to cherish her memory her daughters, Shari W. Campbell (Eggerton) and Angela J. Williams; two grandchildren, Maya and Christian; her sister, Dorothy Wilson and a host of nieces, nephews and friends.